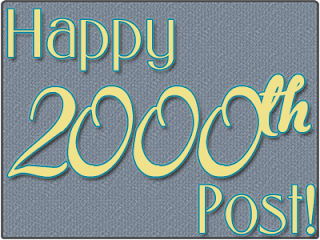 Life of a mad typer: 2000 posts! I can't believe it!!! We are at 2000 posts! Should we do a giveaway?I don't know you tell me! Thanks to all who have been with us over the years! I know I have been slacking lately keeping the blog up and I just haven't had much energy lately but I am working on getting things back to normal. Lots of giveaways coming soon!